It’s hard to believe it, but December is finally here. You’re probably still stuffed from Thanksgiving, but we hope you saved room for Chow Chow! Chow Chow, our annual fundraising event, is held across each of our offices year round, but many of the events are held around the holiday season. All our fundraising events benefit the Howard Hanna Children’s Free Care Fund, which provides critical healthcare to children in need in our communities. This December, our offices are holding seven different Chow Chow events, including the Corporate Office Chow Chow. We invite clients, friends, and family to join us in a fun event (usually, but not always, a luncheon) as we raise money for kids in need. 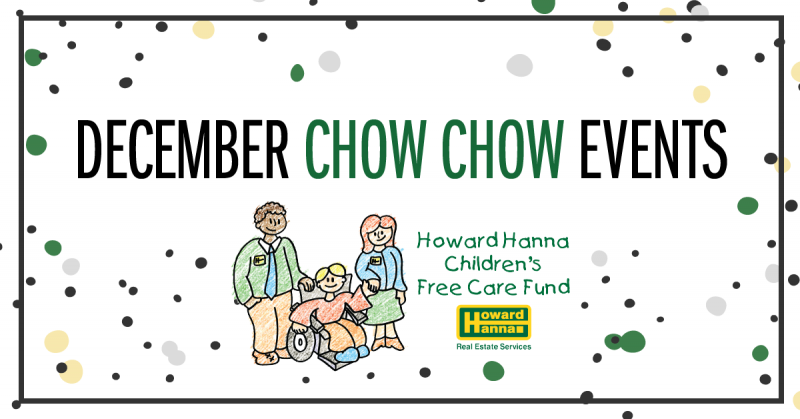 Commercial (Cleveland) Chow Chow, December 5th, 5-7 p.m.
Belle Vernon Chow Chow, December 7th, 5-7 p.m.
Hudson Chow Chow, December 8th, 8:30-10 a.m.
Tonawanda/Grand Island Chow Chow, December 14th, 6:30 p.m.
Home Office Chow Chow, December 14th, 11 a.m. – 2 p.m.
Corporate Chow Chow, December 14th, 11 a.m. – 2 p.m.
Shenango Valley/Greenville Chow Chow, December 30th, 1-4 p.m. So, if you’re feeling too full in December to eat another bite, remember: It’s for the kids! And if you absolutely can’t make it this year, you can still help by making a donation or purchasing a ticket for our $25,000 Raffle. Simply find your local office using the “List of Offices” tab on our Chow Chow website.